Bondi Asian style relaxation massage therapy at the top of the town. Skilled Chinese masseuses will provide a calming relaxation experience, or perform muscle therapy to release tightness. Look for us just a few doors down from the Masonic Hall at the end of the shopping strip. Directions: Located at the northern end of the Bondi shops. 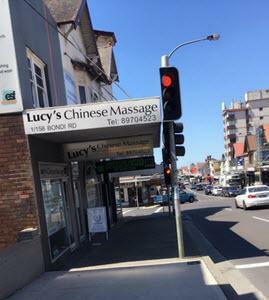 Speciality: Chinese masseuses skilled in therapeutic and relaxation massage, full body massage and stress relief. Parking: Plenty street car parking just 1 minute away. Public Transport: Bus Routes 380, 381, 382 at door, 10 minute service to Bondi Beach and Bondi Railway Station. Premises: Very neat and comfortable clinic. Looking for best relaxation full body in Bondi, Bondi Junction, Woollahra, Bondi, Double Bay, Bronte? Call (02) 8970 4523 Now! Please clicks the stars here to give a rating after your massage. Your written comments & feedback are also welcome.